Seydou Sorogo is not sure what to do with his cocoa farm. He lives in a country with an economy that was built on the back of cocoa exports, but on farms around his home town Bouafle, in the centre of Ivory Coast, the trees are sick. "The new leaves that come out become red instead of yellow and green," he laments. "And then they start dropping off from on high and the skin of the tree becomes like the skin of a leper." Swollen shoot is a disease that is devastating farms in the centre of Ivory Coast, which produces nearly 40% of the world's cocoa, the main ingredient in chocolate. "Those who come to do research say it's a virus, like HIV/Aids," Mr Sorogo says. "It's not easy to fight." The disease has yet to hit the biggest cocoa growing regions, but it is just one of a number of problems affecting an industry struggling to reform and replant an ageing generation of cocoa trees. The uncertainties surrounding the future of the cocoa crop in Ivory Coast have sent world cocoa prices soaring to the highest levels seen since 1977. That has attracted hedge funds such as Armajaro, whose manager Anthony Ward cornered a large piece of the world's cocoa market earlier this year after buying 240,000 tonnes of cocoa beans in the biggest single cocoa trade in 14 years. The world prices are closely monitored from the office of Jacques Kouakou, head of the Fiedifoue cocoa cooperative in the town of Daloa. In Ivory Coast, the price farms charge floats in line with the world cocoa price. But in spite of the current high price, taxes, middle men and reductions for poor quality beans considerably reduce what cocoa farmers get. Ivorian beans fetch about $100 less per tonne than beans from neighbouring Ghana, the world's second largest producer. Mr Kouakou's cooperative is working with the non-governmental organisation Rainforest Alliance to help get more money for the country's 700,000 families that depend on cocoa for their main income. "I think it's way of getting our farmers to produce better quality cocoa," he says. "Since we've been involved in this project, with the agricultural schools and the farming techniques we've been teaching, I think that everyone's making an effort to produce a high quality cocoa for higher quality final product." But quality remains a problem. Farmers have been selling every bean available - even when they have been of dubious quality - to take advantage of the recent high prices. Thirty minutes off the main road, near Gagnoa, home town of the president and football star Didier Drogba, farmers in the village of Fitekro are harvesting cocoa pods that have ripened during the summer. Children spend their school holidays to help their mothers collect the newly harvested cocoa pods. A few metres away, a group of men sit around a large pile of pods, methodically holding the pods in one hand, while slicing them open with a machete. A sweet milky juice that runs off the beans is collected. After a few days of distillation, it turns into a liquor. It is the only product cocoa farmers directly consume from the crop. But in spite of the popularity of chocolate and the current high cocoa prices, an estimated 60% of Ivorian cocoa farmers live in absolute poverty. "It's true that in principal, the farmer shouldn't be the poorest person in any society", says Yao, the chief of the village. "But what should come to us from those further up the production chain, doesn't get here." 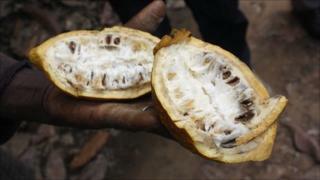 Some farmers have turned away from cocoa to produce natural rubber, palm oil or food. But cocoa has sustained whole regions for so many decades, it is difficult to change. "Our life is cocoa," says Chief Yao. "That's how we live and our future is tied to cocoa. "I think that in the long-term, it'll be fine. There'll be a big change. "So, we can never be discouraged, because we can never leave cocoa behind." Will chocolate cost more at Christmas?